See below for a full listing of all of the April 2019 campaign posts to date. April is widely recognized as Autism Month. This shift reflects input from autistic and other community leaders, as well as our commitment to sharing how AUCD network members are advancing support, research, evidence-based interventions, inclusiveness, and advocacy for the human and civil rights of all people with ASD/DD. We hope you will consider joining us in messaging that goes beyond awareness and promotes full acceptance and appreciation of the many contributions of autistic people. In December 2007, the United Nations (UN) General Assembly designated April 2 as World Autism Awareness Day. First observed in 2008, it is one of only a small number of condition-specific UN days. Its purpose is to bring international attention to this complex developmental disorder that affects as many as 1 in 59 children born today, according to estimates from the Centers for Disease Control and Prevention (CDC).In December 2007, the United Nations (UN) General Assembly designated April 2 as World Autism Awareness Day. First observed in 2008, it is one of only a small number of condition-specific UN days. Its purpose is to bring international attention to this complex developmental disorder that affects as many as 1 in 59 children born today, according to estimates from the Centers for Disease Control and Prevention (CDC). Communication is a basic human right by which people can exercise their freedom of expression and opinion in a manner of their choosing. Many people with disabilities, including autism, experience complex communication challenges and AUCD firmly believes that everyone should have access to communication systems that meet their needs. AUCD network member centers/programs in every U.S. state and territory are playing significant roles in the production and promotion of best practices around communication, including the use of Augmentative and Alternative Communication (AAC). In our collective pursuit of communication for all, we recognize the structural barriers that may impede access. Leaders across the AUCD network are engaged in research, education, and services that seek to reverse outcomes resulting from the denial of communication rights, including: poor school outcomes, increased risk of abuse and neglect, negative health outcomes, barriers in workforce participation, and decreased decision making in community life. 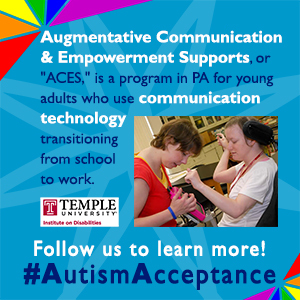 In addition, we recognize that this work must involve true partnerships between autistic leaders and self-advocates, families and support systems, educators, researchers, service providers, assistive technology developers, and others to enact lasting change. 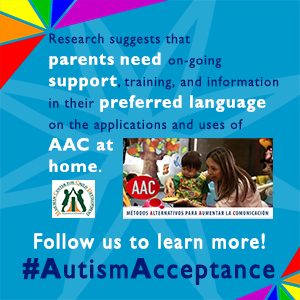 During the month of April, AUCD joins autistic individuals, their families, and those who support them to increase public acceptance and appreciation of the diverse range of abilities and talents autistic individuals possess. 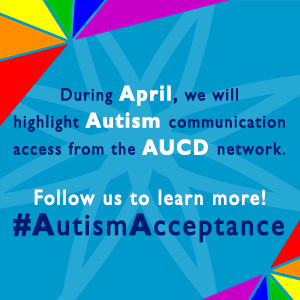 Make sure to follow AUCD on social media, stay tuned to your newsfeeds, and use the #AutismAcceptance hashtag all month long! Following is the complete listing of posts for April 2019. Click on the links below to learn more. & Empowerment Supports, or "ACES"